Olfaction is a very important chemoreception that forms the sense of smell in animals. Terrestrial animals can detect low concentrations of airborne, volatile chemical substances thanks to the olfactory system to accomplish the recognition of conspecifics, predators, and prey. Importantly, even some function like reproductive functions, neuroendocrine regulation, emotional responses, and aggression are associated with olfaction. As the external organ, animals’ olfactory organ is constantly stimulated by some microorganisms including pathogens in the air. Thus, olfactory organs form a unique defensive mechanism that allows them to accomplish the olfactory function and avoid the invasion of any pathogens, which are called nasal-associated lymphoid tissue (NALT). Fish, belonging to early vertebrates and living in an aquatic environment, also rely on their sense of smell to carry out many vital activities, like sensing danger, feeding behavior, etc. 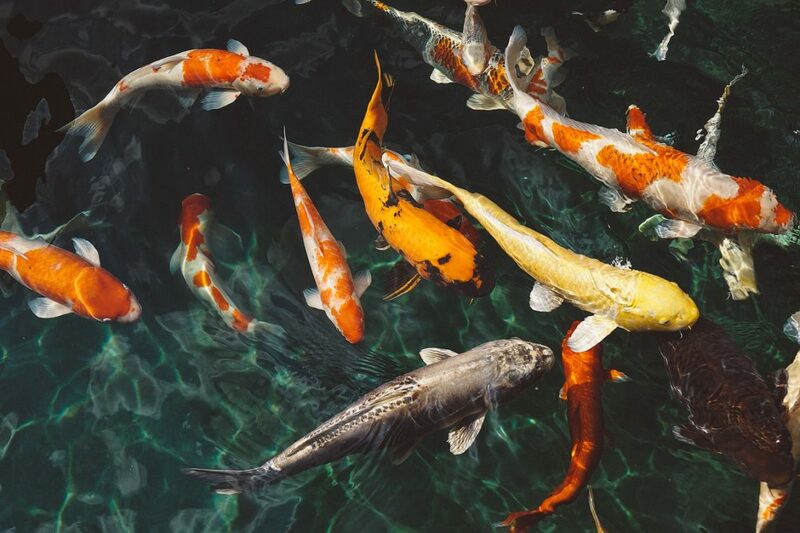 However, different from terrestrial animals, to receive an olfactory signal, fish have to be able to inhale water containing dissolved chemicals, which means the olfactory organ may suffer from many more threats from the external water environment. Hence, an interesting scientific question is whether the fish NALT succeed in forming the immune defensive barrier to fight pathogens. 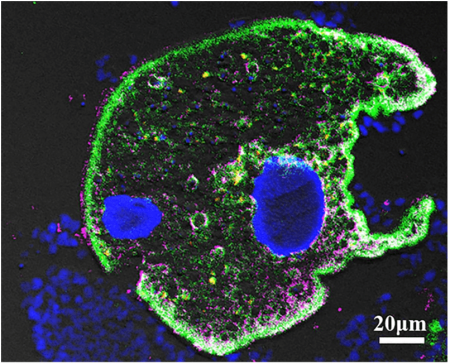 We knew from previous research that fish nose is a lack of organized lymphoid structures (adenoids and tonsils), but NALT is present in this olfactory organ, which is an ancient mucosal immune tissue. Interestingly, NALT serves as a mucosal inductive site for IgA to protect the host organ in humans as well as rodents; local mucosal immune responses were induced in the olfactory surface when challenged with pathogens. However, even though B cells and immunoglobulins (Igs) have been observed in the fish nose, there are some unanswered questions about immune mechanism needed to investigate in fish — for instance, following the pathogenic infection, whether and which nasal immunoglobulin play a role in defending against the pathogen. Moreover, how was it produced in nasal mucosa, through local generating or immigrating from system tissue? 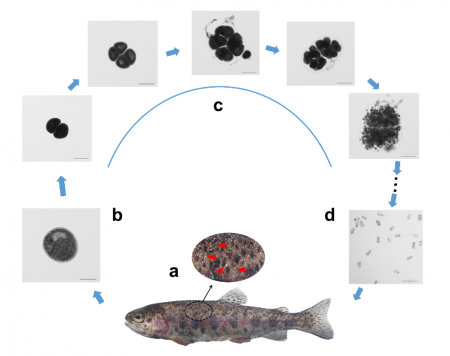 To address these questions, we first need to select a model of pathogenic infection in fish. It is well known that protozoans’ infections are the most common parasite of freshwater and marine fish, and some of them, such as Ichthyophthirius multifiliis (Ich) cause the most common and persistent diseases known as white spot disease. Due to its fast-reproductive cycle and unique life stages (Figure 1), Ich can easily infect a fish and quickly spread to others, causing an enormous economic loss to the fish industry. Interestingly, we use the Ich to infect rainbow trout (Oncorhynchus mykiss), the olfactory organ represents one of the main targets of this parasite as shown with the evidence that high parasite load was detected in the olfactory organ of the fish. Therefore, Ich will be an ideal pathogen for infection to study the role of mucosal immunoglobulins in the olfactory organ. So far, three Ig classes — IgM, IgD, and IgT/Z — have been identified in fish. IgM is the main Ig in serum and plays a crucial role in systemic immune responses. For the IgD, the only function so far found was that it can coat some microbiota at the mucosal surface, indicating it may play a role in homeostasis of microbiota. IgT (also called IgZ in some species) has been identified in teleost fish since 2005, the function similar to IgA in mammals, which play a specialized role in gut, skin. and gill mucosal immunity. In our paper, we used western blot and immunofluorescence to detect that the concentration of IgT but not IgM or IgD increased in nasal mucus after Ich infection, correlating with a large accumulation of IgT+ but not IgM+ B cells in olfactory organs of the same fish, which demonstrated that the IgT may be the main Ig in the nasal mucosa defending the Ich, and the increase of IgT is very likely generated by the IgT+ B cells accumulated in the optimum of olfactory organ. In addition, we found high titers of specific IgT to Ich in nasal mucus of infected and survival fish, and observed that most Ich surfaces in the nasal mucosa of infected fish were coated by a striking abundance of IgT, much lower IgM and IgD (Figure 2). These results demonstrate that strong IgT response occurred in the local olfactory environment, and specific IgM participated in systemic immunity. This leads us to infer that the surviving fish formed the Ich infection, which is difficult to be reinfected, perhaps due to high Ich-specific IgT in the mucus. To further determine that the specific IgT is locally produced but not transported from systemic lymphoid organs, we cultured the olfactory organ and systemic tissues explants for 7 days in vitro and again measured parasite-specific Igs titers from the medium, respectively. High parasite-specific IgT was observed in the medium of olfactory organs, while parasite-specific IgM was found in the medium of systemic tissues such as head kidney and spleen. Interestingly, similar results have been found in mammals; specific IgA was locally produced in the nasal mucosa following infection with a small volume of influenza virus and Naegleria fowleri parasite, respectively. Thus, fish IgT produced locally by IgT+ B cells in nasal mucosa carry out a vital role in the nasal adaptive immune system, like IgA in mammals. Additionally, we found that IgT+ B-cell proliferation responses were detected in the olfactory organ but not in the systemic immune organs (head kidney) of the same fish. This gave us the suggestion that the accumulation of IgT+ B-cells in the olfactory organ is due to local proliferation rather than migration from other organs. Importantly, our experiments suggest that the fish NALT is an important mucosal inductive for IgT and provide the basis for an increasingly advanced understanding of parasite infection, antigen presentation, local B-cell activation, and proliferation, and parasite-specific IgT production occurs in the olfactory organ of teleost fish. More critically, these findings may indicate that nasal vaccination may be an effective way to prevent aquatic parasitic diseases. These findings are described in the article entitled Mucosal immunoglobulins protect the olfactory organ of teleost fish against parasitic infection, recently published in the journal PLOS Pathogens. Zhen is a research scientist at Huazhong Agricultural University and the Qingdao National Laboratory for Marine Science and Technology.